Welcome to the house of fun and fruits! Although relatively new, launched in November 2014th, Fruity Casa Casino made a noticeable impact in online casino world, thanks to its original cheerful loo k and hard-working team, who constantly invest in casino improvements and development. The casino is licensed by UK Gambling Commission, but also welcomes players from almost all over the world! Fruity Casa's welcome bonus is nicely packed 150% up to $250 + 10 Free Spins on Gonzo's Quest! It is available for players from all countries, except the following: North Korea, Iran, Bolivia, Cuba, Ethiopia, Ghana, Indonesia, Kenya, Myanmar, Nigeria, Pakistan, Sao Tome and Principe, Sir Lanka, Syria, Tanzania, Thailand, American Samoa, Belgium, Bulgaria, Denmark, France, Guam, Israel, Italy, Latvia, Northern Mariana Islands, Spain, Turkey, United States Minor Outlying Islands, United States of America and US Virgin Islands. After you use the welcome bonus, there's also ongoing, reload 10% bonus, on every next deposit you make. Almost the whole week carries a daily special bonus, so on Mondays there's 25% Match Blues Buster bonus, on Tuesdays Mystery Bonus Must Have, on Wednesdays there are 3 different match bonuses called Break The Bank Wednesdays! Weekends are reserved for lovely bonus surprises, usually packed as match bonuses with additional free spins. Fruity Casa celebrates holidays and makes them even more special with generous festive promotions! All deposit bonus amounts and/or Free Spins must follow the bonus wagering requirements as stated before withdrawal. All games may not contribute equally to the wagering requirement. The maximum amount of bonus is $250. All deposit bonuses may be on an opt-in basis. The minimum deposit requirement must have been met. For full participation details refer to Fruity Casa Bonus T&Cs. Fruity Casa's strongest point is its variety of games and software, and an even better thing to know is that new games are added just after the launch, followed by a nice match bonus with free spins, for a celebration. Thanks to over 450 casino games, powered by NetEnt, NextGen, BetSoft, Nyx Interactive, Leander Games, Elk Studios, Thunderkick, Amaya, Ezugi, Aristocrat, 1x2 Gaming, Quickspin, 2 by 2 Games and Multicommerce - available in Desktop and Mobile casino (supporting iOS, Android and Windows devices), fun is guaranteed in Fruity Casa. Games are sorted by provider and A-Z, but also by game types, so there are Video Slots, Jackpot Slots, Poker, Blackjack, Roulette, (other) Table Games, Scratch Games, Ball Games and Virtual Games. New Games category is regularly supplied with the newest games, as soon as they are live! Powered by NetEnt and Ezugi live games, Live Casino offers enjoyable Roulette, BlackJack, Keno, Baccarat and Lottery rooms! Fruity Casa awards players as soon as they join! Automatically on registration, all players receive 500 Loyalty Point and then up to 2 points for each €10 wagered. When you achieve 1000 Loyalty Points, you can redeem them into bonus cash. Every 200 points are worth $1 bonus cash (or currency equivalent). List of game contributions can be found on Loyalty Program page. 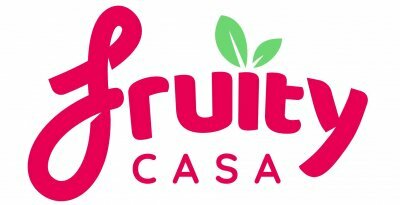 Fruity Casa is aiming to treat each player as the one and only. Knowing how important customer support is, Fruity Casa's must is to have helpful, professional, fast and kind support agents. If you prefer Fruity Casa in other language than English, you can also choose between German, Swedish and Norwegian, with many more to come. Striving to fulfil everyone's taste and preferences, Fruity Casa offera s significant number of deposit and withdrawal options, with NO ANY WITHDRAWAL LIMITS. Deposits can be made through: Skrill, Neteller, MasterCard, Maestro, Paysafe Card, Visa, Visa Electron, POLi, Ukash, iDEAL and Sofortuberwaisung. Wwithdrawals include Bank Wire Transfer as well. Currencies are also available to choose from: EUR, GBP, USD, AUD, CAD and ZAR. Published 12/10/2017 - Offer valid as of date published. T&Cs apply.